The pass rate at grades 9-4 (or A*- C) was 99.2%. The proportion of examinations passed at top grades 9-7 (A* or A) was 70%. The proportion of students achieving a strong pass (9-5) in English and Maths was 96%. The average Attainment 8 score per student was 72.34 (this means that the average grade achieved in the qualifications selected for this measure was higher than a grade 7 or A). The Progress 8 score was +0.78 (this means that, on average, students at this school achieved four fifths of a grade higher in every qualification selected for this measure than students of comparable ability across the whole country). 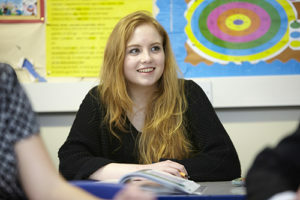 t compulsory at TBGS – 71% chose this combination of subjects. The average point score of students who chose this combination was 6.82. According to the most recent data available (2016-17), 99% of students at this school stay in education or go into employment after Year 11. Further information and comparisons with other schools in the local authority and nationally may be found in the Performance Tables published by the Secretary of State on the Department of Education’s website.